Properties in Whataroa average 4.4 out of 5 stars. Kiwi Cottage is a simple and cozy cottage nestled in the very heart of Okarito! 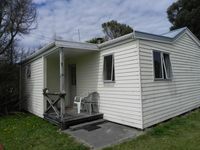 Property 1: Kiwi Cottage is a simple and cozy cottage nestled in the very heart of Okarito! Sea, mountain and rainforest views - life is good in Okarito! 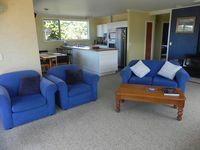 Property 2: Sea, mountain and rainforest views - life is good in Okarito! Wharf Cottage offers views to Okarito lagoon, the Tasman Sea and mountains. Property 7: Wharf Cottage offers views to Okarito lagoon, the Tasman Sea and mountains. Cosy step back in time. Lovely little authentic bach. Basic and no fuss but everything you need. Really lovely hosts had the heater on for us. Loved the fabulous open fireplace for those days where it was wet outside. Genuine period bach; unpretentious and very relaxing. Has everything you need. We are really glad we stayed in Okarito rather than Franz as when the wet weather meant our flights to the glacier were cancelled we had our own wee house and lots to do outside on the beach (rock hunting, seal spotting...) bird watching tours and bush-walks. The shower pressure is a bit sad but fine for a couple of days stay and the beds were uber comfortable with lovely bed-linen which meant super comfortable sleep. Loved it. Great place to stay, well appointed house with brilliant views.